Headphones are a much needed gadget for listening to podcasts, music, audiobooks, and making phone calls. 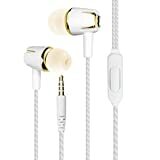 Earbuds are a small, lightweight type of headphones that are perfect for private listening with good sound quality at an affordable cost. Whether you use them for hands-free driving, exercising, or everyday use, this shopping guide will help you find the right earbuds for you. Earbuds come in different shapes and styles to best fit different ears and enhance different types of audio. Earbuds can be standard in-ear, standard in-canal, or wireless bluetooth. Standard In-ear Earbuds: In-ear earbuds are small and lightweight and fit inside the ear, but not inside the ear canal. They keep sound in better than over-the-earphones and can’t be overheard by people around you. In-ear earbuds are an affordable choice for universal audio usage. 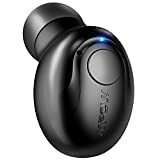 Wireless Bluetooth Earbuds: Bluetooth earbuds are the latest in in-ear sound technology. They have a wire that connects the two buds and use bluetooth to sync with your smart phone or listening device. 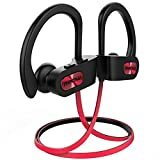 These earbuds are extremely convenient for exercising because they eliminate getting tangled up in a cord while you’re on the move. Some bluetooth earbuds have microphones built in for talking on the phone hands-free as well. Waterproof Earbuds: Waterproof earbuds combine bluetooth and waterproof technologies to create a pair of earbuds for activities on or near water. Waterproof earbuds are great for athletes that sweat too much for regular earbuds, and some can even be submerged up to 12 feet so you can listen to audio while swimming or doing water activities. 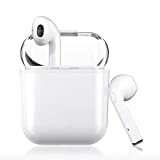 Standard In-canal Earbuds: In-canal earbuds are smaller than standard in-ear earbuds and have soft ear tips that fit inside the ear canal to lock in as much sound as possible. The ear tips are usually replaceable and come in different sizes for precise comfort in the ear. 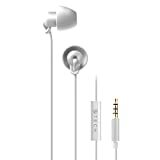 In-canal earbuds have more direct, clear sound for music listeners who want high quality sound. 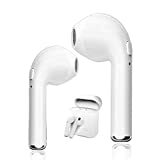 Comfortability: Many reviewers prefer the soft, gummy material of the ear tips on in-canal earbuds when using earbuds for extended periods of time. They rate earbuds they can wear for hours without discomfort the highest. Sound quality: The best rated earbuds are ones that have high quality sound and can cancel out or isolate outside noises. Bluetooth earbuds that isolate outside noises from phone calls are also popular with consumers. Reviewers rate in-canal earbuds and bluetooth earbuds high in sound quality. Rechargeable: Reviewers of bluetooth earbuds prefer earbuds that are rechargeable and have battery life of at least 5 hours of talk time. 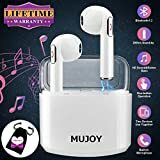 The best rated bluetooth earbuds have standby modes for preserving battery life when the earbuds are away from the phone or bluetooth device. Every ear is shaped differently, so not all earbuds will fit everyone the same way. When shopping for earbuds look for ones that will fit the size and shape of your inner ear. In-canal and some in-ear earbuds have adjustable ear tips for different sizes. 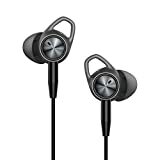 If your old earbuds were always falling out of your ears or fit uncomfortably then various size options for your new earbuds will help eliminate these issues. Different earbuds are made to enhance different types of sound. If you like crisp, clear acoustic sound, then choose a pair that enhances acoustics. Other earbuds will emphasize bass response or reduce white noise. 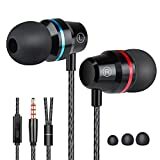 Any earbud model will offer different specific features, so while deciding on a pair of earbuds keep in mind each pair’s sound specifications. When choosing earbuds, there are two ways outside sound can be blocked from interrupting the listening experience: noise cancellation or noise isolation. Noise cancellation is a sound technology that inverts the sounds surrounding the listener so outside sounds are blocked from the ears. Noise Isolation uses a seal on the earbud to physically block outside noises from entering the ear. Both methods will restrict sound interference. Noise cancellation is more effective, and noise isolation is more affordable. If you plan to use your earbuds for talking on the phone hands-free, then choose earbuds that have a built-in microphone. Many in-ear and in-canal models have this feature, but the most suitable earbuds for talking hands-free are wireless high-quality pairs with built-in microphones. Most earbud models have built-in controls for quickly skipping, adjusting volume, or pausing songs. This is a convenient feature that can be found in models of all types of earbuds. 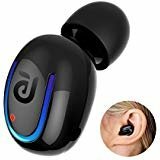 Any type of earbud has models that are waterproof or sweatproof. This is an important feature to consider if you want to wear your earbuds predominantly near water or while exercising. Waterproof features will increase the longevity of your earbuds and protect them from weather and use. Symphonized: Symphonized has combined its passion for music and its creative technology to create Bluetooth headphones made out of wood to deliver crisp, high-fidelity sounds and customer satisfaction. JayBird: JayBird specializes in sports technology and its series of BlueBud X wireless earbuds are the official training headphones of the USA Triathalon team. JayBird earbuds are sweatproof, water resistant, and offer voice prompts for easy use. Jarv NMotion: Jarv is a manufacturer of mobile devices and Bluetooth accessories. 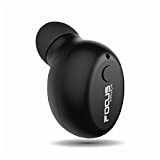 Its NMotion line of Bluetooth earbuds Bluetooth wireless earbuds excellent for fitness with a built-in control unit for volume and play, and clear microphone connection. JLab JBuds: JLab is a consumer audio company that specializes in audio accessories. JLab’s earbuds have an overall balanced sound and are waterproof, sweatproof, and washable.